What is a Lump Breaker? Lump breakers, also referred to as lump crushers, are size reduction machines that crush materials with their state-of-the-art blades. Lump-breaking equipment is able to reduce lumps created in the production, storage or transportation of bulk solids and powders - without generating excessive dust and fines. The rotation of specially shaped blades through a fixed comb gives an efficient lump breaking action. Stedman lump breakers are economical, functional, and can be used on various materials. These lump crushers can process chemicals, minerals, salt, sugar, food products, and many more. Lump crusher design series includes the Aurora™ dual-rotor, Aurora Single Rotor, and the chain mill. Stedman's lump breakers are efficient and effective in size reduction for many products in various applications. The Stedman Testing & Toll Processing Facility is the place to test your material in our full size equipment. If it can be crushed, ground, pulverized or mixed, chances are we’ve done it. We have more than 10,000 test reports to help get you to the best solution quickly. To learn more about what to expect from testing, read this article that ran in POWDER BULK ENGINEERING magazine. 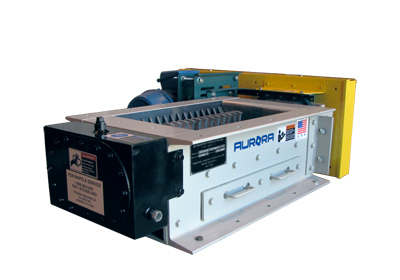 This dual rotor crusher features a dual shaft design that produces a higher throughput and smaller particles. Chain mills represent a cost-effective crushing solution for a reducing a wide variety of materials.